WordMagnets is a really useful tool that students can either use alone on a computer, or that you can use in class with a projector or IWB. Here's a short video showing you how to use it. You can download a copy of the video here and copy suitable for iPod here. WordMagnets is a simple tool that allows you to paste text into a field and then click a couple of times to change the text into word tiles a little like fridge magnets that you can drag and rearrange. 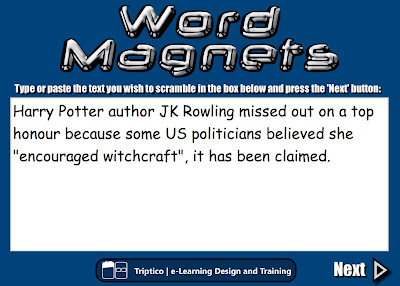 Here's a text that I quickly copied in from an article about J. K. Rowling. I clicked on 'Next', then ignored the opportunity to change the background and clicked 'Next' again and I had these randomised word tiles that I could then drag to recreate the text. This is a great tool that has some really useful features. You can type in and add words to the text, or you can delete word tiles from the text by clicking on remove then clicking the words you want to get rid of. You can also change the colour and size of the tiles, which could be useful if you really want them to stand out on a whiteboard or dataprojector. Revising text - You can get students to test themselves working alone or in pairs on a computer. They simply copy and paste short snippets of text into the text field and generate their won activities. Just two sentences at a time should be enough (Try it, it's harder than you think). Then they have to drag the words back into the correct order. They can check against the original source to se if they get it right. This is great to help them develop an awareness of syntax and collocation. Dialogue build - You can type or copy some short dialogues either from your coursebook or by grabbing text from a movie script (Here's a site that has a huge collection of movie scripts that you can copy and paste from: Drew's Script-O-Rama). First get the students to read or listen to the short dialogues then get them to work together to arrange the words into the correct order (This would be a great time to have the dialogue on an IWB and students could actually come up and drag the words into the correct order themselves). Once you have the words in order you can get students to practice saying the dialogue. Once they have done it a few times, gradually start deleting words. Start with less important ones like articles and prepositions, so that the key 'sense' carrying words remain. See if your students can still say the dialogue. Then ask them to rebuild the text again adding the missing words. This is a great way to get students internalising dialogue. Error noticing - You could use the tool to revise a text with the whole class and actually add in some words that didn't appear in the text as distractors or delete some words and see if students can guess which ones are missing. Extending sentences - You could get the students to arrange a short sentence and then start adding new words to it to lengthen the sentence like the telescopic text from this exercise: Extending a Sentence. You could suggest a word to add to the sentence and then students can decide how and where they make it fit and what other words they need to add with it. Focus on form - You could use it to focus on form by creating an exercise using examples of sentences with a specific structure that you want to revise. Get the students to arrange the words of the sentences then highlight similarities in structure. Parts of speech - You can get students to colour code the parts of speech in the sentence of colour highlight collocations, etc. Word magnets is free, easy to use. You can use it to create materials and exercises almost instantly without any preparation. Once the Flash swf file is open it works quickly in your browser and so doesn't require a fast connection or any software downloads. It can push students to really think about syntax and collocation without having to focus too much on applying sets of rules. It makes text much easier to manipulate on an IWB (if you have ever tried to create an exercise like this on an IWB, you'll know that it takes a long time). You can get students up to the board and moving the words around and changing the colours themselves. It's a shame you cant save activities, but at least this means that you aren't violating copyright by cutting and pasting text as all activities are transitory. It would be useful to have a solution button that you could click and see the words in the right order. Again though this could also be a benefit because it encourages students to keep trying rather than give up and get the answer. WordMagnets is a really useful tool whether your students are working alone or whether you are working with them using a projector. I hope you find it useful. You can find more text based activities for EFL and ESL students here. You've got some cool "backgrounds" that would enable you to play various games with words -- type in your own list, for example, and put them into various categories etc etc. I think this is very interesting. I have been using this site with my kids for revision. I am wondering whether to change over... just based on the game feel that this has as compared to the study feel which the site which I use give. When I first found the Word Magnet site, I wasn't sure about a solid use in my classroom. Once I spotted the different backgrounds (including T-charts, a venn diagram, and multi-celled tables) my mind started to spin. I can see this being a great way to brainstorm ideas, identify key vocab or concepts, or even generate story-starters. Thanks. This is great! I am teaching my grad students about syntax and trying to get them to use Web tools. This is perfect. Word Magnet is great! I am an elementary ESL teacher in Texas. We are currently working on sentence structure and syntax. This will be a great tool to use with my Active Board. The table backgrounds will be good as well to use in doing sorts. Hello, it's Allison again. I wanted to let you know I used WordMagnets in my classroom today. My students loved it; I've shared it with my fellow team members and we have come up with several different activities to do with it. Thanks again! It's Allison again. I just wanted you to know I was able to use WordMagnets in my classroom today. My first graders loved it! Our morning message time had a far greater level of engagement this morning. Thanks again. Let us know about the activities you have come up with. I can't believe you keep finding all this great great stuff - thanks again Nik. Word magnets no longer runs online, but you can download a much improved version design of IWBs from: http://www.triptico.co.uk/download-the-app/ It's an Adobe Air app, so you will have to download that too, but it's still all free.